Do you have Western Australian ancestry? 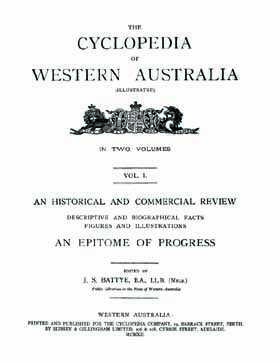 Cyclopedia Western Australia (1912-1913) J. Battye). The Cyclopedias that were published for most states of Australia around the beginning of the 20th Century are a vast resource of historical and biographical information on the state concerned - the people, towns, industries, professional, commercial and social institutions and much more. They include thousands of illustrations; a larger number of these being photos accompanying the biographies which are included. These are not just the rich and famous, but include a high percentage of the ordinary citizens in each community. This is a great genealogy resource for anyone exploring their family history in Western Australia and building their family tree.